This comes together fast and is packed with flavor. Not too spicy to serve even to those who stay away from the heat. Carb-watchers can sub out cooked spaghetti squash for the egg noodles. Just put two halves of a spaghetti squash in the microwave and nuke for 10 minutes. Discard the seeds, and scoop out the spaghetti-like flesh. Bring a large pot of salted water to the boil and cook noodle; drain and reserve. In a large saute pan, heat the first 2 T olive oil; when hot, add the kielbasa and mushrooms. Saute over medium-high heat until browned, about five minutes. Transfer to a bow and set aside. While the mushrooms and sausage are cooking, mix the spice ingredients and toss in a bowl or plastic bag with the chicken tenders, making sure all the chicken is well-covered. Add flour and toss again. After you have removed the mushroom mixture from the pan, add second 2 T olive oil, heat, and when hot, put in the chicken. Saute chicken over medium-high heat until lightly brown and nearly cooked through, about five minutes. Add garlic and tomato paste, stir in and cook one minute. Deglaze with the sherry and cook down until nearly evaporated. Add broth, Worcestershire and reserved mushroom mixture. Mix well & bring to a simmer. Turn off heat, stir in sour cream and scallions. Serve over hot noodles. 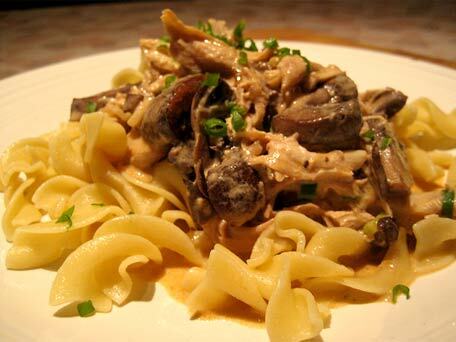 This entry was posted in Main Courses, Recipes, Recipes from Adrienne's pantry and tagged black pepper, button mushrooms, cayenne, chicken, dried basil leaves, dried oregano leaves, dried thyme leaves, egg noodles, kielbasa, kosher salt, mushrooms, paprika, sherry, shiitake, shitakes, sour cream, spaghetti squash, tomato paste. Bookmark the permalink. This recipe is great! And, despite it’s name, it’s not spicy, which is good for our family!